This kit offers a quality front and rear stand for one low price! OPTIONAL HOOKS NOW INCLUDED WITH EVERY PURCHASE! 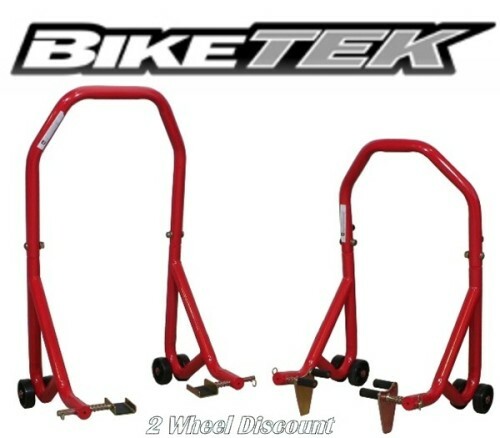 Biketek stands are designed with quality components like 1 1/4 steel tubing construction, red powder coating, 4 three inch wheels for smooth operation and an offset handle for easy gripping. The rear paddock stand comes with cups for under swingarm lifting. The front stand uses 2 prongs for under fork lifting. These Biketek motorcycle stands are perfectly designed for use at home, at the track or for professional use. Each of the stands in these kits are offered separately as well, see my other Biketek products.